Stephen Gaeta, MD, PhD is a physician-scientist currently completing his cardiology fellowship on the east coast. After completing his PhD dissertation on cardiac arrhythmia he wanted a way to display his accomplishment without hanging a diploma on his wall. 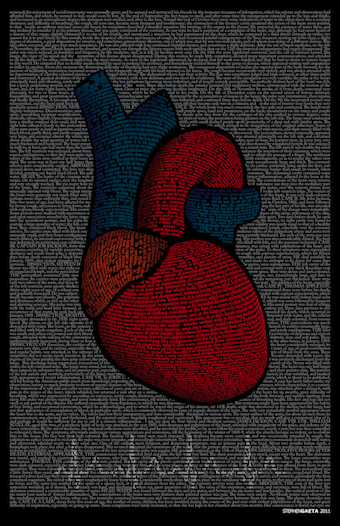 To that end, he used the words of his dissertation to create an image of a heart as a visually appealing testament to his work. He has since continued to create typographical images using text from classic scientific masterpieces as well as additional image series relating to his work in science and medicine.